This arcade-style sports video game features real NBA teams and lets you play with current and past basketball superstars. 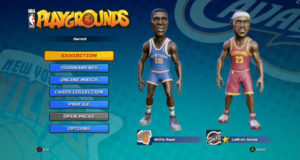 At launch, NBA Playgrounds will offer 3 game modes (Exhibition, Tournament, and Online Play). In this quick NBA Playgrounds video game review I’ll tell you about what’s in the game, how it works, and whether I think it’s worth a play. Want to grab a copy? NBA Playgrounds is available on May 9, 2017. Find out how to get it here. Have you played NBA Playgrounds? Let me know what you think of the game in the comments below. Stop by my Twitch channel to watch some game play of NBA Playgrounds and ask questions about the game live in chat. And don’t forget to subscribe to my YouTube channel to see more videos of NBA Playgrounds and other sports video game reviews, tutorials, and game play.